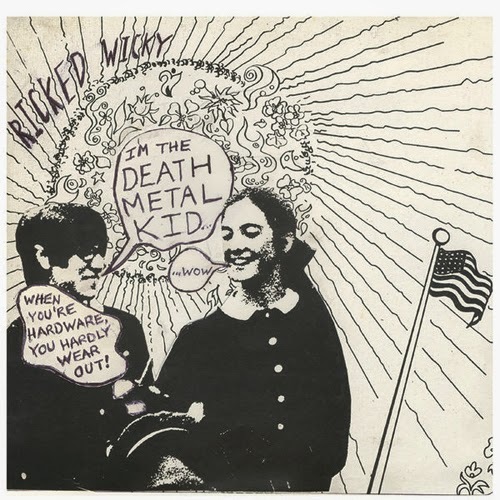 The first of 3 7'' singles released for the first Ricked Wicky LP, I Sell the Circus. Each 7'' on Side B contains an exclusive track written by Nick Mitchell, guitarist of Ricked Wicky and newest member into the ever expanding Pollardian army. In this way, the limited singles offer a Pollard teaser for the new LP, while fans are left getting acquainted with a brand new ballgame on the flipside. Death Metal Kid- Same verison appears on the full-length LP I Sell the Circus. Check out the review over there. Hopefully Not In the Fall- 4 In the same fashion as many of the GBV reunion 7''s, side B is used to showcase someone else's writing other than Pollard's. Here, we are exposed to the first track written (and sung) by Nick Mitchell.The song opens with haunting acoustic guitar picking, more classically trained than that of the typical Pollard catalog. The song has a very desolate Nick Drake feel to it, Mitchell offering some doubled vocals for maximum cold-wind-on-raw-skin effect. Not going to the top of any mixtape, but a welcomed track.